When think of riddims that had a significant impact on the Dancehall industry, we first think of riddims of the 80-90’s. Those have been remade over and over again during the last decades. Therefore, riddims like the “Answer”, “Bam Bam” and “Stalag” are now ranked as classics. The 80’s are considered, by many, as the golden age. But if we take a closer look, a couple of riddims from the early 2000’s have made their way too. The “Diwali Riddim”, produced by Steven “Lenky” Marsden, and released as the 27th volume of the “Greensleeves Rhythm” series could be a classic too somehow. First of all, its uptempo set of indian-flavored percussions and its deep bass line drive you crazy on the dancefloor. Secondly, if you look at the numbers, some of the tracks featured on the compilation did really well on the charts. Then last but not least, there are DJs who still play this riddim to get the people “shaking their thing” on the dance floor. “Get Busy” by Sean Paul was the second single he released off his sophomore album “Dutty Rock” on 05/10/2003. Alongside the singles “Like Glue” and “Gimme The Light”, it propelled his career as a Dancehall artist to an international level. This single remained on the top of the Billboard Charts for a little while and probably got some of you shaking “that thing” on the dance floor a while ago. 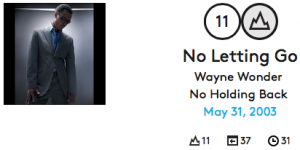 “No Letting Go” by Wayne Wonder, off the album “No Holding Back,” was released only 3 weeks after “Get Busy”. The track was a huge success. It peaked at the 11th position and remained in the charts for 31 weeks (32 for “Get Busy”). It was also a hit in the UK, as it peaked at the third place of the charts. During the summer, in 2003, Lumidee released the single “Never Leave You” (Uh Ooh, Uh Oooh! ), which was voiced on a remake of the “Diwali Riddim” produced by DJ Tedsmooth & Trendsetta. 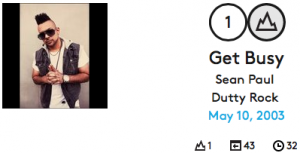 It reached the third position of the Billboard charts and it reminded the people of the sound of the “Diwali Riddim”. Two years later, a young barbadian female singer, rose to fame with the release of a single entitled “Pon De Replay”, featured on her debut album “Music of the Sun”. The single ended up second on the Billboard charts. And now, Rihanna is one of the most popular R’n’B/Pop artists of her generation. So, once again, the “Diwali” contributed to the success of a caribbean artist. A few other tracks off this compilation performed well too. For instance, “Elephant Message” by Elephant Man, the first track of the compilation to get airplay in the US (Billboard Magazine). “My Love Is Wicked” by Brick & Lace was a notable hits too. I’ve always loved the “Diwali Riddim”, but I never realized how significant it was until then. Now that I look at the numbers, I guess it could be ranked as a classic. Share and comment. Let us know if you agree or not.